GeoVision is an industry leader in professional quality PC-based video surveillance. GeoVision NVRs are Windows based, and Geovision software can run on a standard desktop computer or rack-mounted server. The built-in GeoVision video analytics software provides the features that make GeoVision state of the art. Some of these features include face detection, tampering alarm, unattended object detection, missing object detection, smart search, single PTZ object tracking, people counting, and crowd detection. GeoVision owners will also be able to benefit from optional enhancements including panorama view, defog, and video stabilization..
As a reseller of this highly revered brand, Camera Security Now offers turnkey GeoVision surveillance systems at affordable rates. GeoVision brings you the quality of product and Camera Security Now brings you the professionalism, experience and installation to assist you through the process of determining your exact needs and carrying out the solution from start to finish. Access control systems are great for managing who can access certain areas. GeoVision access controllers are great for offices, retail stores, factories and more! These access control systems have loads of features like cameras, intelligent IR, microphones, speakers, push to call, live view, two way audio, remote locking/unlocking. GeoVision's license plate recognition (LPR) cameras are perfect for parking lots, parking garages, entrances and more! Anywhere cars are passing through on a property or where people park. These cameras are designed for all traffic related applications and can reliably capture license plate numbers during the day or night, without motion blur or headlight interference. 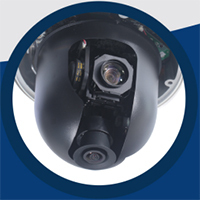 Combining the panorama feature of a fisheye camera with the tracking and zoom agility of a speed dome, GeoVision has created a revolutionary model. With a high resolution fisheye lens, 360 degree panorama viewing and 10x zoom, these cameras catch everything happening in the range of view with no blind spots. These cameras are capable of simultaneously performing pan/tilt/zoom on other points of interest and tracking moving objects.